This is a shape which focuses on connection more than eyeshape. Its efficiency and flexibility are rather high: the liberties stones ratio is 3 and there is not one firm connection. The focal point of this shape is a. 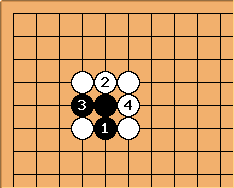 Even if there is already a stone on the focal point, White will still be able to connect three of her stones, while Black's liberties are severely reduced. hnishy I can't agree. 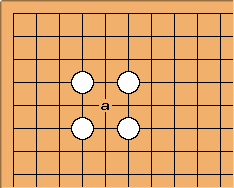 The first diagram is rather a korigatachi (over-concentration). 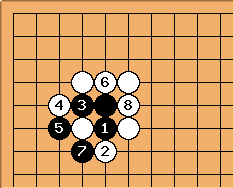 And in the second diagram, White should play a shibori,connecting with sente.